(NationalSecurity.news) A newly released report claims that as many as 17 terrorist plots directed at the United States by the Islamic State of Iraq and Syria have been uncovered since early 2014, as the organization solidifies territorial gains in the Middle East and seeks to expand its global footprint. 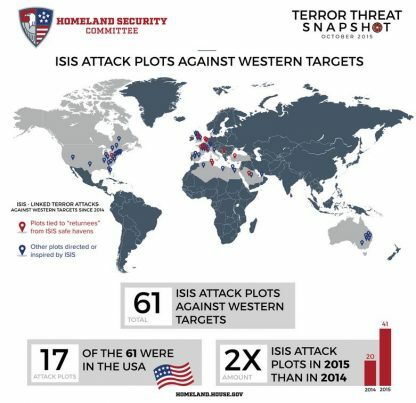 The report, October 2015’s Terror Threat Snapshot,[PDF] released by House Homeland Security Committee Chairman Rep. Michael McCaul, R-Texas, proposes that there is an increasing threat both to the U.S. and its Western allies by ISIS and other Islamist terror groups, In Homeland Security reported. Despite the claims, a review of the data provided by the Homeland Security Committee website reveals that there have only been eight possible terrorist attack plots connected to or inspired by ISIS since early 2014. Of those eight cases, six of them probably would have never developed into a serious threat without FBI involvement – including having FBI informants making extremist statements and supplying weapons to the suspects. Several of the suspects in the supposed “attack plots” didn’t even have actual plans of attack so much as having expressed a desire to carry out an attack. Two of the “attack plots” involved naive, young adults under the age of 21, and another terrorist threat came from a young adult suffering from severe mental health issues since early childhood. “Islamist extremist groups are consolidating their control over crucial terrain and seizing the initiative to expand their global footprint,” McCaul said in releasing the report. “Destabilizing aggressors, from the Putin regime in Russia to the world’s leading state sponsor of terror in Iran, are filling the void of American withdrawal to disastrous effect. “This global surge in radicalism and instability has directly contributed to the elevated threat level here at home. We need decisive American leadership that starts with shoring up our defenses and advancing a credible strategy to stop the threats at the source,” McCaul added. — Efforts aimed at preventing Americans and other nationals from leaving their home countries to join ISIS and other jihadi groups have not been successful. — The Obama Administration has thus far failed to formulate an effective strategy to prevent terrorist travel. — There are major security shortfalls overseas as well, which are putting the U.S. homeland in danger. — ISIS has been able to maintain its “core terrorist safe haven, while expanding its global footprint,” according to the report. — Threats have increased over the past year as the United States and Western allies used mostly airstrikes to target ISIS facilities, training camps and forces. — The alleged number of U.S. terrorist cases involving homegrown Islamist extremists has gone from 38 in July 2010 to 127 today — more than a three-fold increase in just five years. In all, intelligence services claim to have uncovered 61 plots by ISIS to target U.S. and Western cities. Overall, that is more than double the number of plots uncovered in 2014, according to the report. In addition, intelligence officials are concerned that ISIS and other groups are taking advantage of the huge migration of war refugees via infiltration and subterfuge. “Despite nearly 14 months of airstrikes, the United States and its allies have failed to roll back ISIS,” the report states. “In fact, the group has largely maintained its core terrorist safe havens in Syria and Iraq while expanding its global footprint. Click here for more breaking news on terror threats to the U.S. from independent media sources.